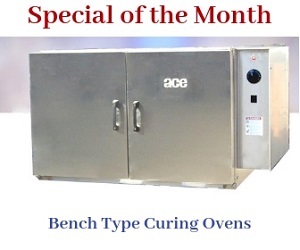 The ACE Model 270 RT burn off oven is among powerful products within the burn off oven inventory. It has the capacity to heat clean medium to large parts, or components that are heavily coated with grease, oil, dirt, and dust. The oven’s primary burners provide 250,000 British Thermal Units (BTUs) per hour. Adding to this, the afterburner provides an input of 500,000 BTUs per hour. Two top mounted relief hatches ensure that pressure within the oven during is maintained to a safe level, and removed when necessary. The oven is designed with 6 primary water nozzles, and 4 second water nozzles, thus ensuring a quick and efficient cooling down process. To understand more about the oven’s technical design, please refer to the specification tables below. Volume Over Cart 331 CU. FT.
1 Top Mounted Pressure Relief Hatch 27.00 SQ. FT.
4 Natural Gas Inlet Pressure 8ʺ to 14ʺ W.C.
5 Propane Inlet Pressure 12ʺ to 18ʺ W.C. The standard design of the model 270 RT adheres to UL and ISO certifications. Depending on the client’s requirements, we can also design the oven to adhere to the regulations laid down in FM and NFPA–86A.